Lock in a great price for Zurich Marriott Hotel – rated 8.1 by recent guests! Great quality breakfast. Excellent lobby and front desk customer service. 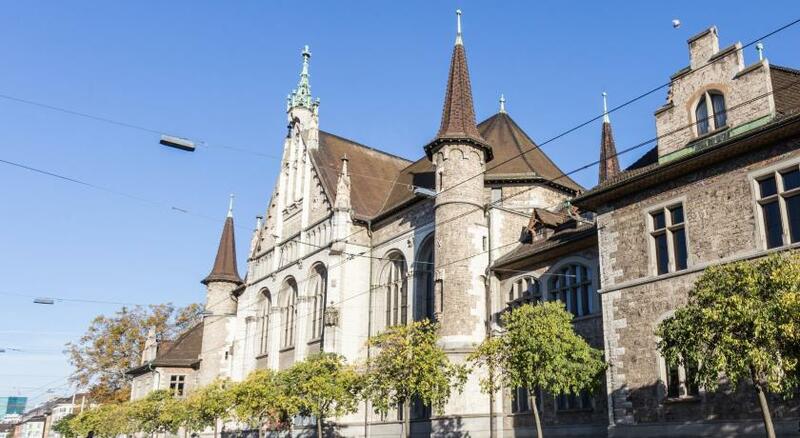 Location is excellent and easily walkable to central Zurich. Top notch Thai restaurant (with a price to match). The location was good due to the close proximity to the Zürich main railway station. We have swiss travel pass and it’s easy to reach the hotel by traveling different places. Also hotel is good in staying due to its secured and with lot of privacy. Everything was excellent. The stuff is very friendly and helpful. The location is good, close to the city center and also close to the main train station. The restaurant in the Hotel is fine. The welcoming was very nice from the staffs, and there having a promotion to upgrade the room for a small amount. The hotel location was great. Zurich Marriott Hotel This rating is a reflection of how the property compares to the industry standard when it comes to price, facilities and services available. It's based on a self-evaluation by the property. Use this rating to help choose your stay! One of our top picks in Zurich.The elegant Zürich Marriott Hotel is located in the heart of the city, only a short walk from the business and shopping districts, and the sights of the Old Town. Free WiFi is provided throughout the hotel and 24-hour room service is available. Guests can enjoy premium beds, free coffee and tea making facilities, air conditioning, and wireless connectivity for up to 6 devices in the stylish and innovative rooms. Most of the rooms feature panoramic views of the city or the lake. Luxury toiletries of Acca Kappa are offered in the bathroom. All guests of the Club Rooms, Junior Club Suites and Suites enjoy access to the exclusive M Club Lounge, where snacks and drinks are available for free day and night. Work desks with high-speed internet connection, printers, scanners and photocopy machines are available 24 hours a day. The eCHo restaurant serves modern Swiss cuisine. A rich breakfast buffet with regional products is served until 11:00. The popular White Elephant restaurant is known for its’ authentic Thai specialties. At the Bar & Lounge 42 with adjacent cigar lounge, guests can enjoy a selection of premium spirits. The gym is open 24 hours a day, and there is a sauna and a solarium. A selection of massages is available on request. Zurich Main Train Station is 1,800 feet away, providing direct access to Zurich Airport within 10 minutes. When would you like to stay at Zurich Marriott Hotel? Spacious and air-conditioned room with either 1 king-size bed, 1 queen-size bed or 2 twin beds, all featuring Marriott bedding with down mattress toppers, duvets and pillows. The room also offers tea and coffee making facilities and Acca Kappa luxury toiletries. Public parking is available on site (reservation is not needed) and costs CHF 4 per hour. These rooms offer premium bedding, coffee and tea making facilities and Acca Kappa luxury toiletries. Overlooking the Limmat river, the spacious rooms offer complimentary bottled water, complimentary food & drinks in the M Club Lounge, premium bedding and Acca Kappa luxury toiletries. These rooms offer premium bedding, coffee and tea making facilities, and Acca Kappa luxury toiletries. The stylish rooms offer lake views, premium bedding, complimentary food & drinks in the M Club Lounge, complimentary bottled water, tea and coffee making facilities, and Acca Kappa luxury toiletries. The suite has stunning panoramic views of the city and Lake Zurich and features a large bedroom with a king-size bed which has Marriott bedding with down mattress topper, duvet and pillows. This suite also has access to the M Club Lounge, where guests can enjoy nonalcoholic beverages and snacks throughout the day. This spacious suite with city or lake views has a separate living room and seating area and a large bedroom area featuring a king sized bed with Marriott bedding which includes down mattress topper, duvet and pillows. Guest also enjoy access to the M Club Lounge where nonalcoholic beverages and snacks are served throughout the day. Our eCHo Restaurant provides a genuine Swiss experience! Take a seat in our original ski gondola and enjoy a culinary ride with modern Swiss food and fancy details. Hotel surroundings – This neighborhood is a great choice for travelers interested in old-town exploration, shopping and walking – Check location Great location - show map Guests loved walking around the neighborhood! House Rules Zurich Marriott Hotel takes special requests – add in the next step! Zurich Marriott Hotel accepts these cards and reserves the right to temporarily hold an amount prior to arrival. Bathroom shower should have been cleaner. Hair from previous use still there. Basically its not bad, but comparing with other Marriott hotels its the worst I've been. Ascetic room with average bed but it was called "king-size", room service and house keeping are not really coherent. Price doesn't match quality in my opinion. Parking fees No complimentry water with the room. Bed is very firm but sadly pillows are not. Super uncomfortable. Executive lounge was so hot for the first few days we couldn’t stay longer than a few minutes. Luckily someone else made comment and the last day it was no heating and we could relax and enjoy it, which given the price of the executive rooms you want to be able to. Food at the bar pretty pricey. the location was a bit far from center. We had only 24 hours in Zurich to explore, but we had to walk 17 minutes to the center from the Hotel. We ended up using UBER which costs 10 EUR. Also the parking is a bit on the expensive side. Everything was great. Bedding, cleanliness, and the staff were all helpful and nice. BUt the location was a bit far from center. We had only 24 hours in Zurich to explore, but we had to walk 17 minutes to the center from the Hotel. We ended up using UBER which costs 10 EUR. Also the parking is a bit on the expensive side.